The Fields tab of the sObject editor helps you to review the properties of any field in an object and easily to create new fields. Open a necessary object file and navigate to the Fields tab in the editor. The Fields tab represents all the fields of an object file in a table view. In case, if the object file does not contain any fields, you'll see a message, that there is no data to display. the icon means that the field is required on one or more layouts in the project. If you'd hover over the icon, you will see the list of layouts where that exact field is marked as required. You can filter fields by their types: click on the filter icon in the column's header, and you will get a filter window. You are also able to sort data in a descending or ascending order — just click on the column's header. In addition, the Config columns button at the top of the tab allows you to see in the table only those columns that you need right now. Just uncheck the columns that aren't necessary at the moment and close the window. In addition, you can the Field Usage Report for a certain field — open any object file in the editor and click on the Open Field Usage Report window button at the toolbar. To have the ability to edit a field, you need to expand its row. You can do it by a simple clicking on a 'plus' in the necessary row. NB: You have the ability to edit only the custom fields, not the standard ones. 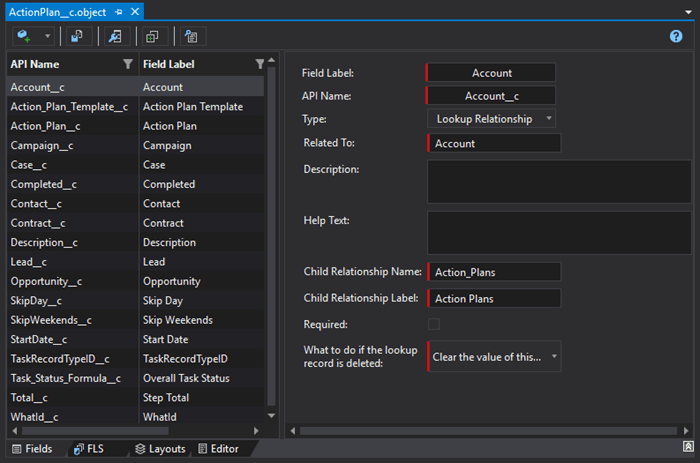 In the details section on the left, you will see the field's general properties, such as Label, API Name, and Type. Also at the same time, to the right of the details section you will see the specific properties for the given type of a field, for example, a length, decimal places, and the default value for the fields with 'number' type, and so on. Using the 'details' section, you can also edit the field definition. After this, when you create a new field, you will get an API name field filled automatically after typing a Label for this object. NB: Currently, if you change the API name in the field, you won't edit the current field but create a new one. Also, if you delete the field from the editor, these changes won't be displayed in the Fields tab. You are able to quickly modify formulas or default values without going to the Salesforce UI and without doing raw XML editing. Click on the . . . button next to the Formula body field and modify a formula in the Formula editor. 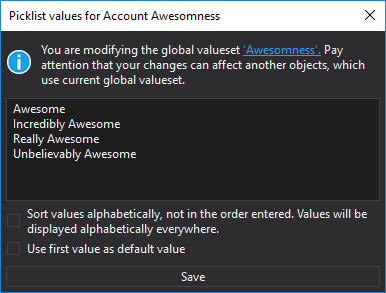 If you need to change some values in the value set, press the . . . button next to the Values field. Your change will also affect other objects and fields that are using that Picklist Value Set. Make all needed changes in the field's properties using the inputs and drop-down lists. Red vertical lines mark the required properties for this field. All your changes are immediately displayed in the object file in the lower part of the split editor and vice versa. NB: All changes in the file are not saved until you use the Save or Save & Deploy options. To add a new field, just click the Add field button at the top panel of the tab and select the necessary type for the new field from the drop-down list. You'll get an expanded new row for a field with empty inputs. NB: When adding a new field, it's strongly recommended to add the __c ending to its name. 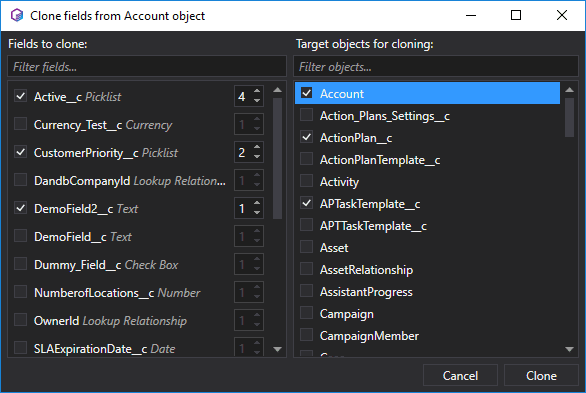 With the help of the feature of cloning in the Fields tab, you can clone necessary fields (one or more if needed) to necessary objects (one or more if needed) multiple times with just one click. In order to do this, click the Clone field(s) button on the toolbar. In the opened window, you'll get the list of fields from the opened object file and options to clone them. 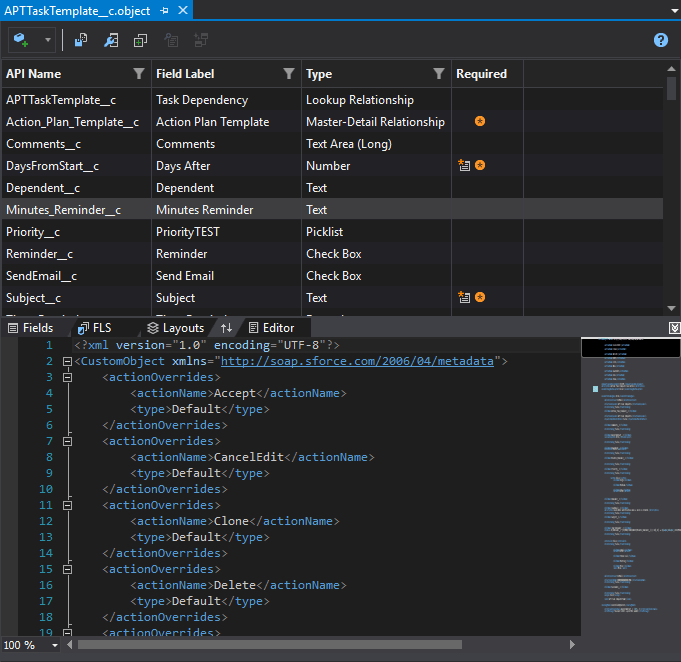 The IDE will modify the corresponding XML file(s) for target object(s) with the cloned field(s) and open them in the editor, so you can modify them. Delete Dependency — if you select this checkbox, the dependency between these fields will be deleted, otherwise, on the next step, you will be able to create or modify it. values of the dependent field are shown as checkboxes in each column. 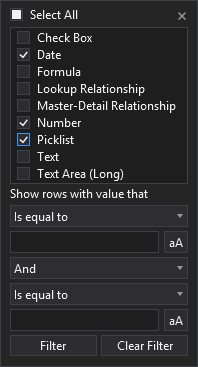 By setting checkboxes you can allow or forbid certain values of the dependent picklist according to the value from the controlling picklist. At the same time, there are bulk ways to control checkboxes: you can click on a column header to check / uncheck all checkbox in that column, or you can check / uncheck the first checkbox in each row to check / uncheck it. In the lower part of the wizard you can see the 'Preview' section. In this block, you can see two picklists: for both controlling and dependent fields, and you can see what options you will have in a dependent picklist when you'd select any value from the controlling field. When everything is done, click the Next button for these changes to be applied to the organization immediately. the Save & Deploy button — saves your changes and deploys the changed file to your organization. If you left the required fields empty, the deployment process will fail and you will get an error message in the Error List panel with the name of the field, which is missing any required details. NB: In cases where the deployment has failed, you'll see an appropriate message in the Error List panel and in the status bar. At the same time, the changes in the object file will be saved. To revert your changes, you need to use the standard Undo option of the editor via the Ctrl+Z hotkey. 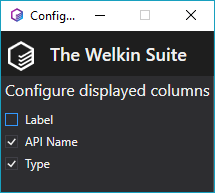 The Welkin Suite is always ready to lend you a hand if you ever have questions about some functionality of the Fields tab or the process of accomplishing some tasks here. When you need to learn more about this tab or its elements, click on the Help icon in the top right corner of the window. You will get an opened page of The Welkin Suite's Documentation related to this functionality in your default browser.